Teased late last month we were expecting to see official images and details for this release on October 26th. But thanks to Figure Oh scans leaking a little earlier than expected we have our first look at two new upcoming Premium Bandai Products, The Super Sentai Artisan Aura Changer & Kiba Changer! Thanks to an anonymous poster on 2chan the first image of this pair is currently making the rounds and WOW do they look great! We can almost hear the droves of Power Rangers fans out there who hope to see this item re purposed for the Magna Defenders morpher as the original DX toy was. The Aura & Kiba Changers are headed for release in March 2017, presumably as a set for 10,584 yen. but we’ll have full release details and official images on October 26th. It’s the gimmick that just won’t ever fade away, Ranger Keys! Today we’re taking a look at just the latest set from Premium Bandai released in this 5 year old line of collectible trinkets. Today’s subject is the Ranger Key Set Metal Hero Edition! While that does indeed fill in most of the gaps for collectors, there’s still a few left that may irk some (mostly me). For now enjoy over 75 images of the Ranger Key Metal Hero Edition along with group shots comparing this set to the Ranger Key Complete Edition released for Super Hero Taisen Z. Click “Discuss on the TokuNation Forums” at the bottom of this post to see the full gallery! Following up from last years Tyrannosaurus themed coin, Henshin Vault has manufactured 100 Green Ranger themed coins exclusively to be sold at the Lexington Comic & Toy Con this weekend! These are available only to the first 100 people who seek them out, where they’ll be sold at the Merchandise Booth just inside the entrance on the first floor of the convention center. These bad boys will run you $40 there and are entirely compatible with every release of the Legacy Morpher as well as the Super Sentai Artisan Dino Buckler. Images come via the Henshin Vault & LexCon facebook pages! Pre-Orders for these items have gone up at a few online retailers but it’s only a matter of time before they’re up everywhere. Keep your eyes peeled! CLEAR Catalog Images for Doubutsu Sentai Jyuuouger Online! The incomprehensibly annual grainy image period is over! We finally have our first true clear look at Doubutsu Sentai Jyuuouger! 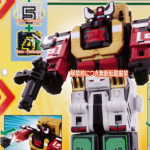 These new images finally give us a good look at several upcoming DX toys in the Jyuuouger line. 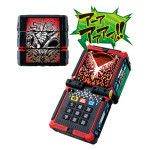 The Jyuuou Changer is indeed a cubical phone with a rotating element (think Rubix Cube) that allows you to choose the mode it’s used in (henshin, shokan, gattai). The Jyuuou Buster sidearm is confirmed to have both blade & gun forms. We get our first look at Jyuuou Eagle’s personal weapon the Eag Riser which is apparently also a segmented whip weapon! But most interesting of all we get a fantastic look at the DX Cube Animals of the series! We’ve previously seen Jyuuou King, but these new images provide us with looks at Cube Elephant , Kirin, Tiger, & Gorilla. Kirin can become a Bazook for Jyuuou King, Gorilla Tiger & Elephant can merge together to form Jyuuou Wild! And these images also confirms a huge rumor, Jyuuou Eagle can transform into Jyuuou Gorilla! Join in the discussion on these new images in our ongoing Doubutsu Sentai Jyuuouger thread! Credit for images & translations courtesy of Sungel on Rangerboard! Discuss on the Tokunation Forums› Views: 9357 › Credit: Sungel on Rangerboard! While we want to tread lightly after the faked catalog scans that appeared online yesterday we believe this is a much more credible set of information. 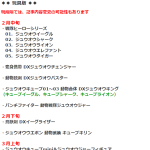 If you recall last year thanks to the CraneJoe Blog we got some pretty early & spot-on information on what Shuriken Sentai Ninninger’s toy line would consist of. Well he’s back this year with what looks to be a rundown of the entire initial toy line for Doubutsu Sentai Jyuuoger as well! While there is of course always a chance that this information is false, CraneJoe has proven to be a reliable source for toy information in the past. Let us know what you think in the comments below! Actual images of Doubutsu Sentai Jyuuohger shoulder be popping up online in the very near future! 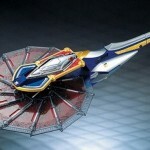 Premium Bandai Ranger Key EX Metal Heroes Edition Revealed! Premium Bandai has been on a Ranger Key kick this year with announcements of sets like the Sentai Lost Legend & ToQger Rainbow keys. Today brings yet another awesome reveal with the introduction of the Ranger Key EX Metal Heroes Edition Set! Curiosuly that’s yet another set of Metal Hero keys where Toei has conveniently forgotten the final 2 series of the franchise. B-Robo Kabutack, which shared a crossover with both B-Fightes. And the follow-up to Kabutack, Tetsuwan Tantei Robotack. Perhaps those keys will be released eventually. For now the EX Metal Hero Key set will retail for 13,500 yen and be released in February! 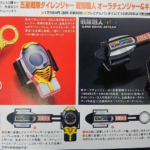 Super Sentai Artisan Dino Bukcler & Guardian Beast Medal Set Revealed! In yet another surprise reveal tonight, Premium Bandai has just shown off a pair of upcoming Super Sentai Artisan releases from Kyoryu Sentai Zyuranger! First up is the Super Sentai Artisan Dino Buckler Set! Based on Bandai America’s Legacy Morpher, this piece has been repainted in the proper markings for Zyuranger and includes the belt holster as well as the Tyrannosaurus Medal. As an added bonus this set also includes the Tyrannosaurus Dino Crystal! The Dino Buckler will be available as a Premium Bandai Exclusive in March 2016 for 10,584 yen. To accompany the Dino Buckler Premium Bandai will be releasing a Guardian Beast Medal set! This set includes all 6 Dino Medals, one for each Guardian Beast, as well as the 7th tribal/group medal! These are of course made with diecast as is the Buckler. This Medal set will also be available in March 2016 for 4860 yen.